DALLAS – October 13, 2010 – For the entire month of October, Pizza Patron will be raising funds in all its stores for the St. Jude Children’s Research Hospital. 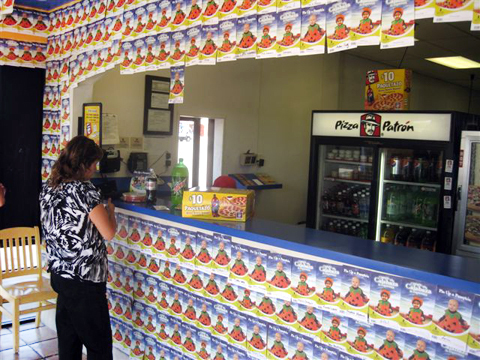 Pizza Patron stores have St. Jude posters and counter top displays up that explain how and why to donate. St. Jude is a pediatric treatment and research facility in Memphis, Tennessee which treats children with cancer and other catastrophic diseases. Founded by entertainer Danny Thomas on the premise that “no child should die in the dawn of life”, the hospital is well-known for being the only pediatric cancer center in the country that won’t charge parents for any treatments not covered by their insurance plan. No child is ever turned away from St. Jude’s because of his or her family’s inability to pay. Gamm explained that donations of any size can be given and the donation will be indicated on the receipt in a separate line item. One-hundred percent of the money raised will go to St. Jude’s. In 2010, St. Jude Children’s Research Hospital was named the number one children’s cancer hospital in United States by U.S. News & World Report. Discoveries at St. Jude have changed how doctors treat children with cancer and other catastrophic illnesses. Since St. Jude was established, the survival rate for acute lymphoblasstic leukemia, the most common type of childhood cancer, has increased from 4 percent in 1962 to 94 percent today. St. Jude has treated children from across the U.S. and from more than 70 countries. Doctors around the globe consult with St. Jude on their toughest cases. Additionally, St. Jude has an International Outreach Program to improve the survival rates of children with catastrophic illnesses worldwide through the transfer of knowledge, technology and organizational skills.